The website of ResumeProfessionalWriters.com is very trendy and professional and yet, we got some immediate concerns when we saw the homepage. Why? Well, unlike many other resume writing services that offer a refund within a set period, this company only offers to re-write your resumes if you do not get a job within 60 days. Should you be concerned about this, or is this company worth the investment? Check our ResumeProfessionalWriters review to find out. Services here are a bit strange, since the company only offers packages. This is somewhat limiting, since you cannot order a cover letter or thank-you letter separately. You’d have to pay an entire package to get different services. The range of services is solid, but this limitation can pose a bit of a struggle. You can choose between basic, deluxe, premium and ultimate resume package, all of which come with different features. For example, the basic resume option provides you with resume only, combined with free revisions and Word and PDF copies. But, if you choose the ultimate package, you will get a resume, cover letter, thank-you letter, follow up the letter, LinkedIn profile building, free e-books, posting to 50 job boards, all within one working day. The bigger the package is, the more benefits you get. However, the difference in pricing here is enormous, which may make you reconsider purchasing a package that contains so many features. Paying up to $485 for a package is an outrageous price, considering that the biggest package contains only four writing services. When compared to other companies, this company is highly priced, which is probably why there are very few ResumeProfessionalWriters reviews online. 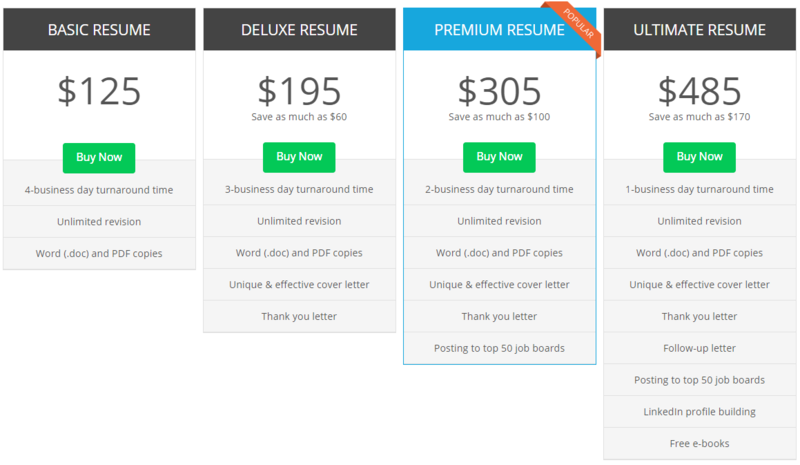 The cheapest price you can pay at Resume Professional Writers is $125 for a resume only. Unfortunately, this is the final rate offered by the service, since they do not really provide customers with discounts or special offers of any kind. At the moment of our evaluation, we found no limited special offer or any permanent discount, not even for first-time customers or returning customers. And seeing that no feedback online suggested there is a discount, we can confirm that this company is one of the most highly priced services on the resume writing market. For such a high fee, we expected to get a better quality service, especially since we chose the package the company says it is most popular – the premium resume package. This package cost us an incredibly high rate of $305 and consisted of resume, cover letter, thank you letter, and posting to 50 top job boards. The resume was of solid quality, but the cover letter was very vague. They probably deliver the same cover letter to every customer, since it was too general and would apply to all jobs and qualifications. In addition to this, the company delivered a thank you letter but did not provide us with the list of postings to the job boards promised in the package. All we got was a confirmation that the resume was posted on some job boards. There isn’t much information regarding guarantees to be found on this website. Aside from the mention of the guarantee we explained in the beginning, there isn’t a page or content that explains these guarantees in detail. Aside from the 60-day hiring guarantee that applies only for revisions, the company also guarantees free lifetime document storage, unlimited revisions and free future resume update These are basically all the same guarantee but in different words. Since the information about guarantees was very limited, we decided to contact the customer service and ask for some details. They replied promptly but did not give us other information than the one we found on the website. As we feared, they do not have a money-back policy, but only revise the resumes from your package if you do not get an interview within 2 months. Overall, Resumeprofessionalwriters.com is a legit resume writing service with some interesting packages, but their pricing is too steep for anyone’s budget. With prices that range up to $500, this is the most costly company we have found. In addition, their lack of discounts and guarantees are a big disadvantage. Finally a real resumeprofessionalwriters.com review! When I saw how much the company brags about their services, of course I ordered from them. Yet, it was completely the opposite of what I expected. I basically spent an entire fortune on a terrible service with good marketing strategy. This service should really change their name. It’s more of an essay writing than resume writing because resumewriters.com did a disaster out of my resume order. It looked like a cover letter, but a bad one.